Hands on: Sony Xperia Z Ultra review | What Hi-Fi? Massive phones are all the rage these days, and now it's Sony's turn to bring a behemoth blower to the market. 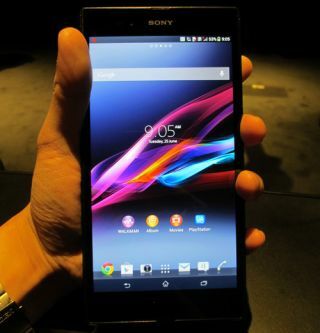 The Sony Xperia Z Ultra is a tablet-sized phone (some say ‘phablet’) and the latest option for people who don’t think regular phones are big enough. The Xperia Z Ultra is unlikely to fit into your jeans pockets, but it sits neatly in Sony’s portable line-up, offering the same design language as the Xperia Z smartphone and the Xperia Tablet Z (also seen in our pictures along with a Google Nexus 7, below). The front and back are made of tempered glass, framed by a band of aluminium. Despite its size, it's actually nicer to hold than the original Xperia Z thanks to rounded edges. It’s also surprisingly light at 212g. At 6.5mm thick, it’s the world’s thinnest Full HD smartphone. Sony says it’s difficult to make things much thinner without changing the standard 3.5mm headphone jack. Huawei has just managed 6.18mm with its Ascend P6, though, even if that only has a 720p screen. The back is rather bare aside from a lot of fingerprints, an 8-megapixel camera and a logo reminding you that the phone can handle NFC (Near Field Communication). On the left side is a magnetic port (for the optional charging cradle), as well as a waterproof flap hiding a regular micro-USB port. The right side has a similar flap for micro-SIM and micro-SD cards, as well as familiar power and volume buttons. We’re finding it difficult not to keep coming back to the phone’s massive footprint. Whatever Sony’s intentions, it certainly feels more tablet than phone. This is for people more likely to text, browse or watch films than make phone calls. Sure, you can make calls as well as any other phone, but you’d look (and feel) ludicrous. It’s not just about making things bigger, though. Trickling down from Sony’s 2013 Bravia TV range is the Triluminos display, which widens the colour palette to make shading more natural. There is also X-Reality processing, which takes images closer to HD quality by analysing the picture and adding pixels based on pattern, outline and colour. When it comes to sound, Sony has beefed up its Walkman app with an equaliser, as well as virtual surround sound. Walkman has also been integrated with Sony’s Music Unlimited subscription service, which aims to take on the likes of Spotify with high-quality streaming and offline listening. No doubt the PS4 will join the Xperia family fairly seamlessly once it's released, too. In line with the others from the Xperia Z range (and the recent trend to make machines we can drown) the Z Ultra is waterproof. It has an IP58 certification, which means that it can be submerged in up to 1.5m of water. You can even film in Full HD while doing it – a rather literal approach to taking photography to a different level. Sony seems pretty confident about the waterproofing: take a look at the headphone socket and you’ll notice it’s been left uncovered. Not content with simply crashing Samsung’s phablet party, Sony has decided to undermine the Galaxy Note range’s writing abilities. Unlike Samsung, Sony doesn’t restrict you to a proprietary stylus: you can scribble and sketch with any old pencil. You don’t get the varying levels of sensitivity like you get on Samsung’s S-Pen, but the handwriting recognition works well, and we like not having to worry about losing that little stick. The Sony Xperia Z Ultra is also the first phone in the world to come with Qualcomm’s Snapdragon 800 2.2GHZ quad-core processor. That’s the one that supports 4K video and 7.1 virtual surround sound, so it’s more than capable of handling Android 4.2 Jellybean. But with great power comes great consumption, so Sony has installed a 3000mAH battery, which boasts a standby time of up to 550 hours (22 days) –presumably using the Stamina Mode that first appeared on the original Xperia Z. Want to watch videos on that massive screen? Knock that down to 5.5 hours. A super-sized, super-charged, waterproof phone that you can write on using a pencil? It’s a tough act to follow for Samsung and its as-yet unconfirmed Galaxy Note 3. Sony has shown that it’s no longer enough just to make products bigger. The Sony Xperia Z Ultra release date and price has been revealed as September and 719 euros (around £600) and the phone comes in black, white or purple. We’ll be getting our hands on the final unit nearer the time, so stay tuned to whathifi.com for the full review.